With ubermix, the most important participant in the development process is you! The build process for the next version of ubermix (1.0) is well underway, and with it will come a number of changes and enhancements that we think will make the experience better than ever for students and teachers. ubermix 1.0 is based on the latest version of Ubuntu - version 12.04 "Precise Pangolin" - which is a Long Term Support (LTS) release that Canonical (the parent organization) intends to provide updates and fixes for until 2015. This makes it an ideal base for the next ubermix release. At this stage we're experimenting with a number of UI enhancements and are in need of your thoughts/opinions. We think these enhancements add to the overall experience, but not without a few drawbacks, so your thoughts are essential as we move forward. 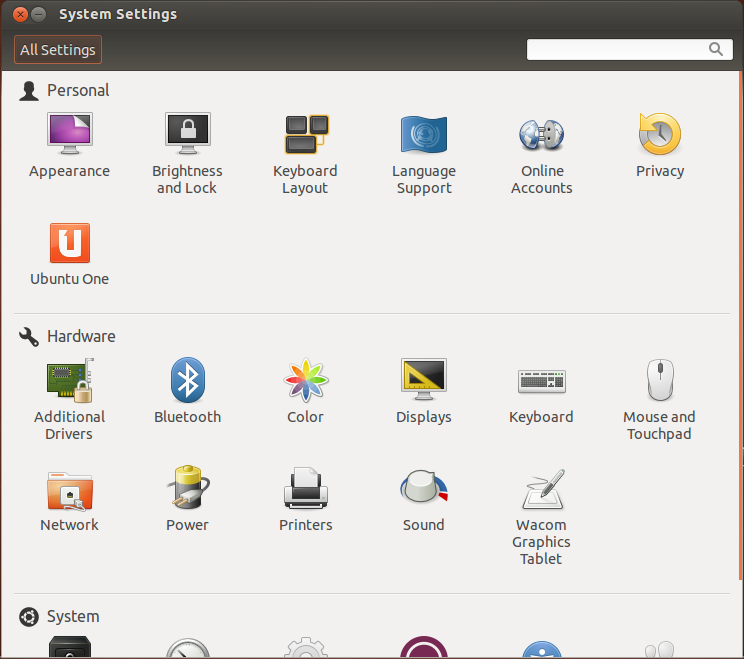 One of the features that we intend to enable or ubermix 1.0 is called Global Menus, which pushes most menu bars and window controls into the top panel in a similar fashion to MacOS. This offers the benefit of eliminating both the menu bar and the top window border from application windows, increasing the usable screen area on devices with smaller screens. On a netbook, for example, the added height can make a big difference in a vertically oriented application like OpenShot, enabling a user to view more tracks or a larger preview window. Of course, you can always use the left "Super" key ("Windows" key, if your device had the misfortune of originally shipping with Windows on it) to show and hide all windows, and Alt+Tab to switch between open windows, but you won't have that "quick glance" of open windows on the system. Also, while Global Menus work in most applications, they don't work with every one, so there will still be some applications with menubars in the traditional place (LibreOffice is one of them). Feedback welcome. As you can see, there is just a little marker to let you know where you are on the page until you point to at, at which point it expands into a "handle" you can grab or click the up/down arrows in. Again, this frees up some window space for smaller screens, but doesn't work in a few of the apps, where you will see traditional scrollbars. Feedback welcome. Keep in mind, however, that it might be a bit trickier to customize the icons that appear here, so we could certainly go back to the older model. Again - feedback welcome. I hope you'll take the time to think about these pending changes and offer your feedback. If you are so inclined, below you will find links to first alpha, or "preview" releases of ubermix 1.0 to try on any of your hardware. Please bear in mind that these are early builds that are not feature or app complete, and likely to be buggy, but certainly fun to work with. Follow the install instructions here to get yourself a quick look. ubermix-key1.0CTalpha1.img for brand new hardware, like Cedar Trail netbooks. 1. 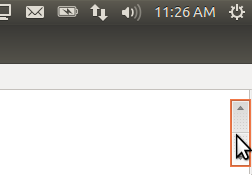 A simple and easy to reach option to swap the layout of the min, max, close buttons in the title bar. Users coming from MS Windows have a tougher time adjusting to the seemingly 'mixed up' layout. I wouldn't suggest changing the default button layout to match Windows, even though most users are accustomed to that UI, but making it an easy change would be nice. 2. Losing the semi-transparent background, only if it is consuming additional system graphic resources. There may be an easy way to change this already but it's something that I've worried about for older, slower machines that we try to repurpose. Adjusting the window button layout is actually quite simple. All you have to do is open a terminal and run gconf-editor, then navigate to /apps/metacity/general/button_layout and adjust as you see fit, according to the instructions provided at the bottom of the window when you click the button layout settings. You can arrange the window buttons any way you like. The interface is actually 2D, even though it offers the illusion of being 3D, so the resource requirements are extremely minimal. 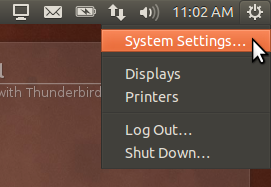 Shouldn't be a problem on older hardware, but if it is you can switch to the classic launcher in the systems settings to eliminate the transparent background. Note that this option is not yet available in the alpha, only the v0.9x branch. 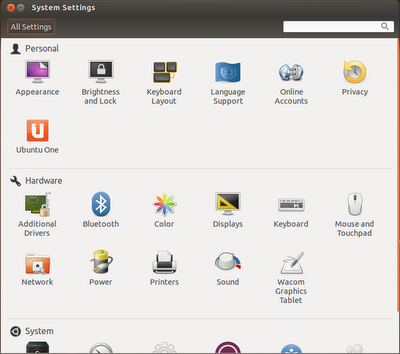 I like the general concept of the unified menu. However, I do really like being able to see available windows and switch between them with a single click. Also I have found that some apps in Ubermix don't offer buttons for closing the window so the only way to quit an app is ctrl-w or right click on the icon in the taskbar and choose close. Am I missing something? Would these buttons be for all apps in Ubermix 1? I will download now and try it out. 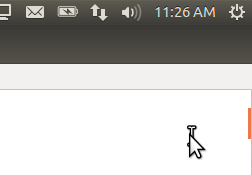 In ubermix versions prior to 1.x, the close box is an "X" in the window tab that runs across the top middle (has the window's name in it), directly to the right of the window icons. Double-clicking the window tab de-maximizes the window, and the typical buttons will reappear. 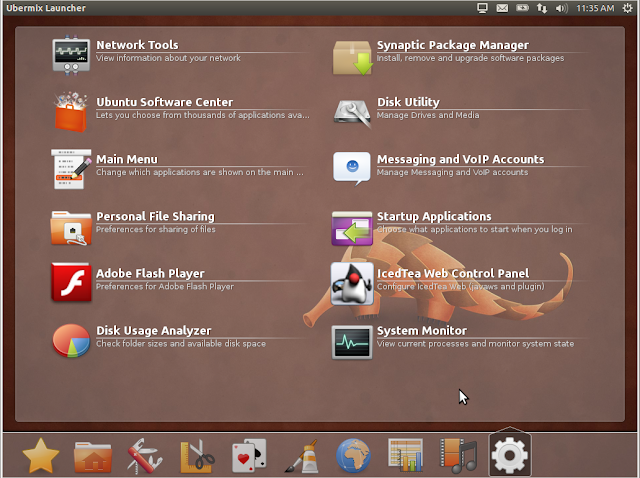 On 1.x, the window buttons will almost always be left of the menus in the top-bar as in the example above. Considering ubermix is made for schools with 1:1 laptops - I personally loved the old menu. I loved that students were not able to "hide" windows. Before ubermix, this was a huge issue because students could tab in and out of windows without a teacher seeing. I would like to see that feature stay the same. This could go a step further and the menu could maybe have a recent activity button to retreive accidentally closed programs, but also an easy way for teachers to check if a student has been on task. @Thomas the launcher places indicators next to recently used applications, so it would be easy to see what the user has been doing with the device. That said, the best way to handle this is to use a monitoring program like iTalc, so that you can see what they are all doing. Our teachers project their iTalc monitor screen so that the kids police themselves. See this page on the ubermix wiki for details. Jim, do you have any advise on how to take our customized Ubermix build that we are using and get it into VirualBox? Our teachers love the .904 build that you had in Virtual box, however they would like one in 12.04LTS so they can demo with the students. You're a life saver. Thanks! Jim, I also noticed that Software Center sits and spin when I'm trying to load the list of installed apps. Spin fixed in ubermix 1.03. Also uploading a new VM for 1.03 now.